In the wake of Superman's Regime, Ted Kord hung up his costume and gave up being The Blue Beetle. 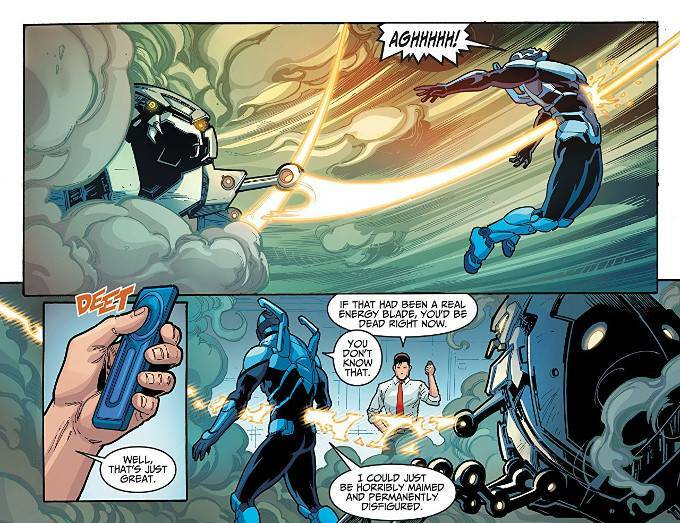 Now, when he isn't busy inventing and running his company, he's training a new Blue Beetle - Jaime Reyes. Yet events are approaching that will require Ted to put on his tights once again. Unsurprisingly, Injustice 2 continues to be a wonderful comic. The artwork by Bruno Redondo, Vicente Cifuentes and Rex Lokus continues to be picture perfect - pun very much intended with a BWA-HA-HA-HA in the bargain. And every Ted Kord fan who swore a blood oath of vengeance on those involved in writing Countdown To Infinite Crisis will likely swear an oath of fealty to Tom Taylor for the story presented in this issue. The Final Analysis: 10 out of 10. A Must Read!